It’s one thing to witness cycling become so popular that I and others no longer feel members of a renegade tribe, but to have my long love of dirt riding suddenly to become fashionable with the added indignity of calling it ‘Gravel’, is almost too much to bear. But I’m not bitter. 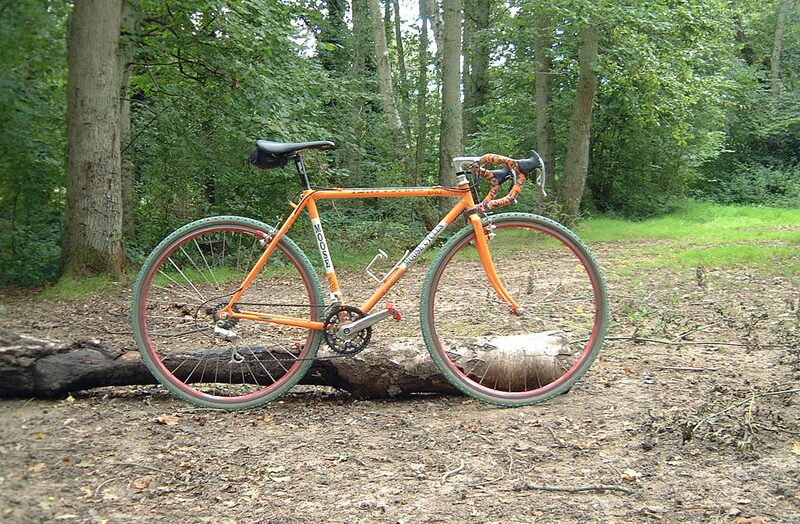 I have been riding ‘gravel’ for years as borne out by my look back at my late 90’s cyclo-cross bike. Sadly this bike is no more after a crack appeared in the frame atop Titsey Hill on the North Downs and it was subsequently thrown away in 2003 I think I then went slightly mad and chose a new aluminium frameset. I now sigh with regret that I didn’t get it welded back to together so that it could roll for a another decade or two. My orange ‘Moose’ stickered up in a South London bike shop colours then an associate of the Arctic Race Team, was acquired by me when my blue 80’s Gios cross bike just looked and felt too old fashioned compared to the latest steel bikes of the time and I gave it away in the mid 90’s (yes I was a fashion victim). The bike in the form shown is circa late 1990’s early 2000’s and features parts that reflect that I not only raced it, but that I also went out into the hills following the dirt. One route that I still ride today is the ‘Three Pimples’ based around the Down/Biggin Hill area of the North Downs and ridden in homage to the northern Three Peaks. This route became a favourite for the nascent London Phoenix Cycling Club and where members could get in practice for that great event. You should note the triple chainset coupled to a mix of Campagnolo Record and Shimano, this worked great if you avoided the smallest rear cog and the smallest front chain ring. At that time most cyclo-crossers seemed to ride 39/52 or a 50 chainring with a 12/25ish rear set and this was just too big a gear for me to push. My set up allowed me to spin over rough ground and when required it helped me to ascend steep North Down hills (i.e.Titsey Hill – dirt path). It also allowed me to ride up the climb up from the bottom of the course at Maryon Wilson Park without having to get off, which was frowned upon in the manuals (if steep, run it, it’s faster they said). Like so many cyclo-cross bikes of the time it’s a machine built up with all sorts of kit and is a far cry from today where groupsets and uniformity of brand prevail. For me my ‘Moose’ cyclo-cross bike represented the ability to mix the road, farm tracks and trails into a great ride and this remains true today. Rear Mech: Campagnolo Record Titanium 8 speed (1996) – finally mangled at old Eastway. Orange is a great colour for cyclo-cross as it can brighten up the darkest winter day.